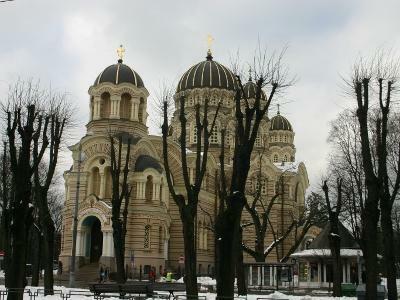 Located on the River Daugava, Riga covers an area of over 307 square kilometres. How many people inhabit it? This city on the Baltic Sea is home to more than 722,000 people. In Riga, the people speak Latvian. English and Russian are also widely spoken. The Latvian currency is the Lat (Ls), which can be divided into 100 santims. Tell me about one of Riga’s top attractions? Even though it's located outside the city itself, the Bobsleigh Track in Sigulda is on of Riga's most popular attractions. What's not to love about speeding down 1,420 metres of icy track at over 100 km/h? Groups of three rush down the track accompanied by a bobsleigh expert. If that heart-stopping, adrenalin-pumping experience isn't enough, you can also try out the frog, where you navigate a track on your stomach as you watch the ice whiz by. Anything else which shouldn’t be missed? Plenty! 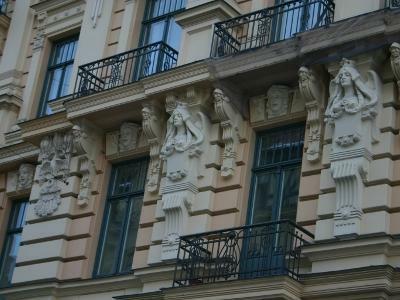 Riga has lots of great things to see and do. 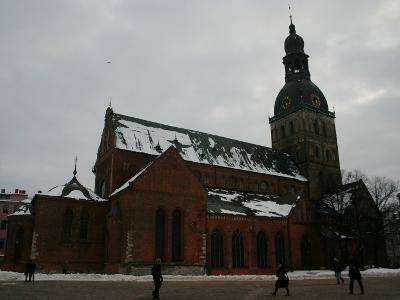 These include St. Peter's Church and tower in Old Town. Make the short elevator trip up to the tower's viewing platform and once you step outside you'll be able to see stunning views of Old Town, the Central Market, the Daugava River and much more. The church interior is pretty impressive in itself. Make sure to check out the Latvian National Museum of Fine Art on Kr. Valdemāra. This impressive gallery is housed in an early 20th century building which was purposefully built to serve as an art museum. Here you'll see over 52,000 paintings and sculptures by Latvian, Baltic and Russian artists. 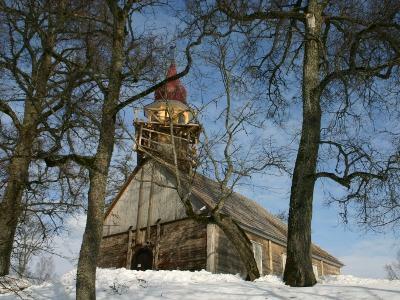 If you're up for a trip outside the city centre, head to the Latvian Ethnographic Open-Air Museum close to Lake Yugla. It takes about 15 minutes by taxi and the museum is well worth the trip. From the homes of fishermen, potters and peasants to animal dwellings and religious structures, this open-air museum is home to around 118 different buildings brought here from all over Lativa. Spread across 80 hectares of breathtaking countryside, you can just wander around and take in the natural beauty while learning about Latvian life in days gone by. On average how much does it cost to get into Riga’s top museums? Most of Riga's museums charge an entry fee. However, it should be noted that you can visit the Latvian Museum of Occupation free of charge. This museum was founded in 1993 and it sees 100,000 visitors each year. It chronicles the years between 1940 and 1991 when Latvia was occupied by two different regimes. Exhibits include clothes, arms, documents, books, photographs, ornately carved chess sets, musical instruments, toys and even hair, all telling the story of this occupation and the people it affected. After all that culture, say I want to hit the shops. Where should I go? You'll find some great shopping centres in the city centre. These include Origo, Galerija Centrs and the Stockmann department store. Throughout all these multi-level centres there's an excellent mix of local and international brand names, as well as a wide variety of products. There are lots of great bars and clubs scattered throughout the city. For the biggest concentration of top-notch venues, head to Riga's Old Town area. Like most countries, it's best to carry some kind of ID with you, like say a photocopy of your passport. However, you probably won't be asked for it here. Up on the 26th floor of the Reval Hotel Latvija on Elizabetes you'll find the Skyline Bar. Here you can sip on a cocktail while enjoying incredible views of Riga. If you can, try and get one of the window-side seats at dusk, where you can sip your drink and watch as Riga lights up beneath you. Also, make sure to check out the bathrooms, where you'll be able to see some of the best views of Old Town. For something a bit different, go for a drink in a Mad House on Kaļķu. A stone's throw from the Freedom Monument, it has both a top location and a great atmosphere. Inside, you'll find an eclectic mix of kitschy designs. The booths to the left as you walk in are reminiscent of rooms, and one has a really cool faux-window complete with drapes and a cityscape just outside. Over on the other side of the substantial bar island you can chill out at one of the many table with a drink. There's a dance floor down the back and the place can get pretty packed with people shaking a leg to the dance tunes preferred here. One of Old Town's favourites, Cuba Café is a boho bar with a cool atmosphere and a great drinks menu. Popular with a youngish crowd, this bar lives up to its name with lots of Cuban bits and pieces scattered around, as well as lively Cuban music cranked up on the bar's impressive sound system. Before you order a drink in Riga's bars, ask what the price of your tipple of choice will be. That way you'll be able to avoid places that try to charge visitors more. Is there anything to do that doesn’t include alcohol? Of course! Along with a number of great live music venues, Riga also boasts the impressive Kino Riga, located on Elizabetes. Before you hit the theatres inside, make sure to check out the amazing art work outside the building. Instead of the standard movie posters, here you'll see hand-painted versions of these ads. Inside, the classy décor matches the arty and indie movies shown. Is it expensive to eat out in Riga? It's not. In fact you'll be surprised at how much you get for your Lat here. Reasonably-priced three course meals aren't hard to come by and you'll also see a number of places doing great value lunch specials too. Throughout Old Town, as well as in the Art Nouveau district around Elizabetes street, you'll find a wide variety of eateries. Are international cuisines well represented? They are! From Italian pasta dishes to American-style burgers, you won't have a problem finding somewhere in Riga that serves international dishes. Take a short tram ride out to the LIDO Recreation Centre on Krasta. Spread over three floors, it's a great choice if you're looking to try out some traditional Latvian food without breaking the bank. You can choose from over 500 different dishes that make up the bountiful buffet. Traditional dishes such as grey peas, along with many other Latvian offerings, can all be sampled. Another great option is K|I|D* on Pulkveza Brieza iela. From its funky interior, which features an open kitchen with a well-stocked salad bar, to its friendly staff, this spot is definitely worth a visit. Pastas, salads, meat and fish dishes and much more are all on the menu here. Charlestons or Čarlstons on Blaumaņa is a great spot for lunch. It offers great value soups and salads, as well as large and delicious pizzas. You won't be waiting long for your food; however, if you have short attention span and you're sitting in the front part of the restaurant, you can keep yourself amused by creating your own works of art on the brown paper tablecloths with drawing materials provided on each table. What times do restaurants close? Most restaurants in Riga open until at least 11pm, with many others serving food into the wee hours of the morning. For the best fresh ingredients, as well as a huge selection of tasty pastries and cakes, check out the Centrāltirgus or Central Market. This extensive affair opened in 1930 and is located inside old-school zeppelins. Vendors offer a huge selection of foods from fresh fish to dried fruits. How many different modes of public transport are there in Riga? Riga has a number of different forms of public transport. These include trams and trolleybuses. Trams run on 11 routes across the city, while the trolleybus network encompasses 20 routes. Services operate daily from 5.30am to 11.30pm. When entering a tram, you can get a ticket from the driver. However, an electronic smart card system is also in the works. Well, even though a large number of attractions are concentrated around Riga's Vecriga (Old Town) area and can be reached on foot, you will need to use public transport during your stay, especially if you want to visit some of the popular places outside the city centre. Where in the world would you be if you were looking at this building?